Rated 4.0 out of 5.0 based on 893 surveys. 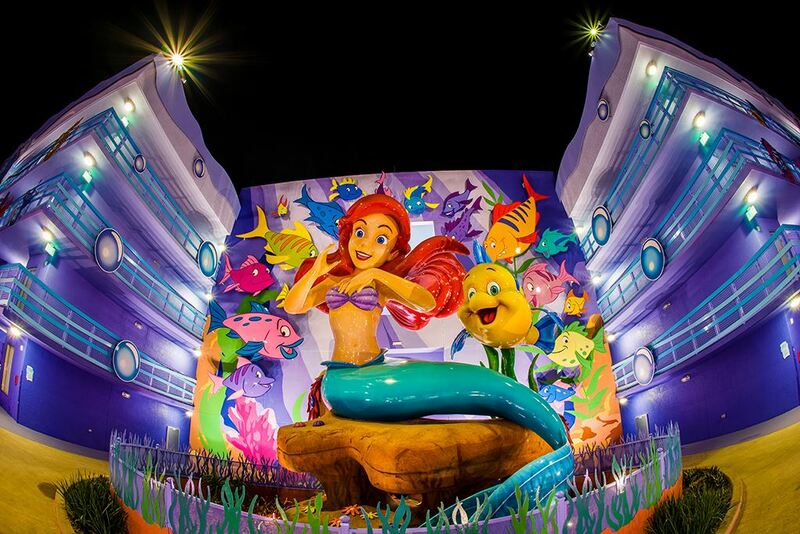 Disney's Art of Animation is a highly-themed, value-level resort at Walt Disney World. 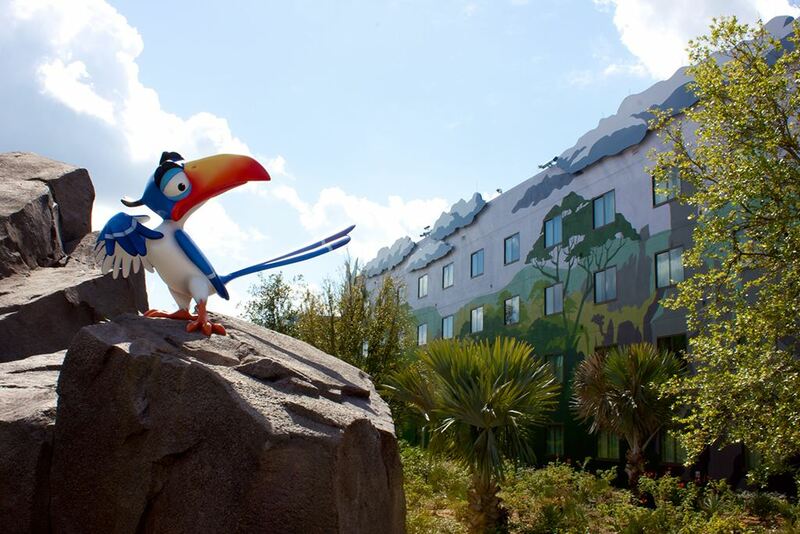 Art of Animation includes both standard hotel rooms and "family suites," which are indeed perfect for families. The suites are a reasonably priced option which include two rooms, two bathrooms, and a kitchenette. 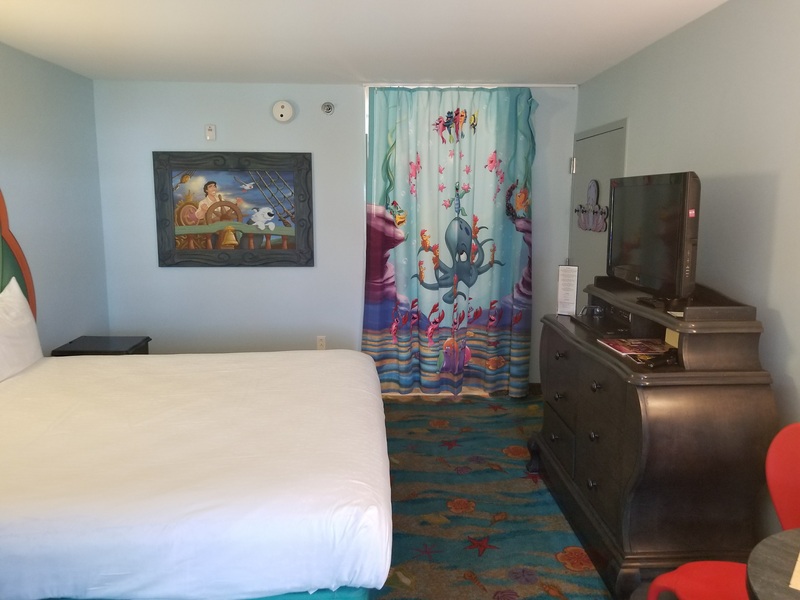 If you have a family of five or six, or if you just don't want to sleep in the same room as your kids, the Art of Animation family suites are one of the best lodging options at Walt Disney World. 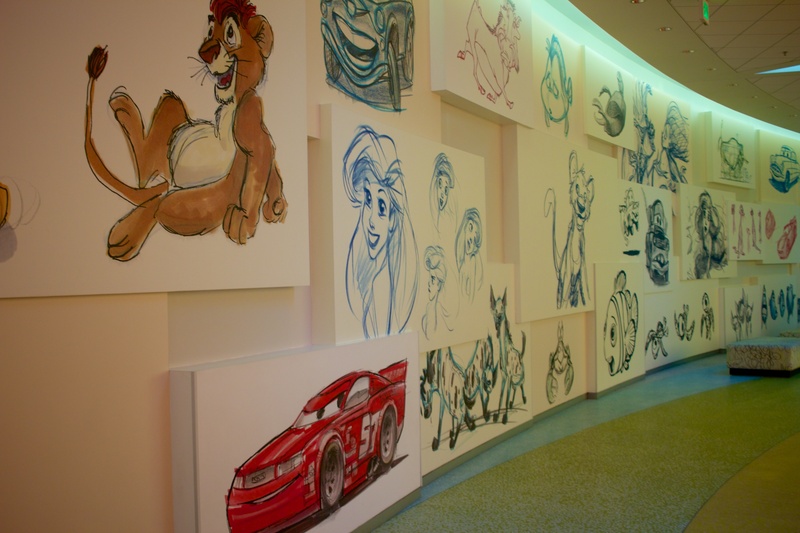 The Art of Animation rooms, exterior spaces, and pools are themed to one for four Disney-Pixar films: Finding Nemo, Little Mermaid, Lion King, or Cars. The Landscape of Flavors food court is the best on Disney property, featuring a variety of customizable fresh food options. The majority of the resort’s accommodations are 1,120 "family suites," each of which accommodate up to six guests. Additionally there are 864 standard rooms, each accommodating four guests. 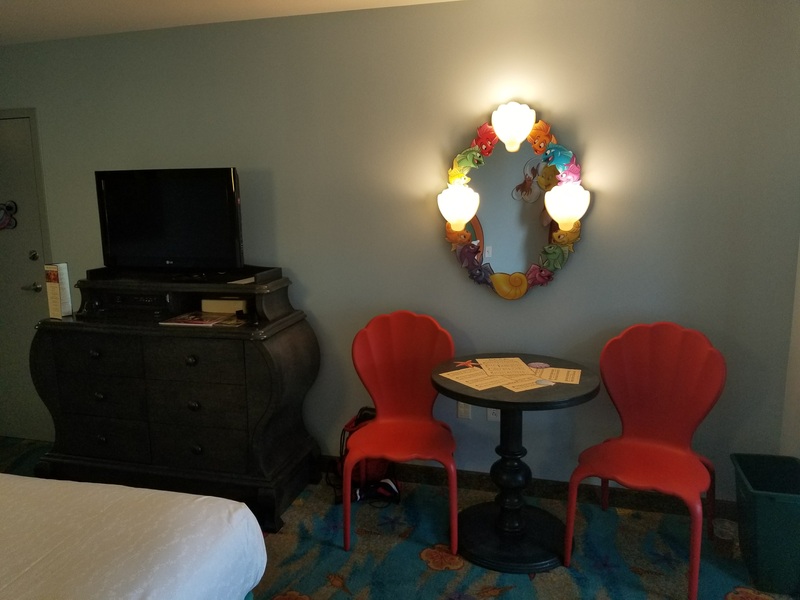 The suite buildings have interior hallways to the guest rooms instead of the exterior walkways found at the standard rooms and at Disney’s other value resorts and at Disney's moderate resorts. Three of the four themed areas have pools; the Lion King complex has a playground instead. 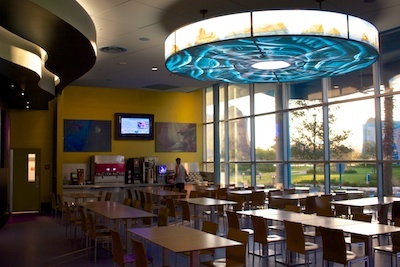 Like the other Value resorts, Art of Animation has a central building—here called Animation Hall—for check-in and bus transportation; it also holds the resort’s food court, Landscape of Flavors; a gift shop; and a video-game arcade. 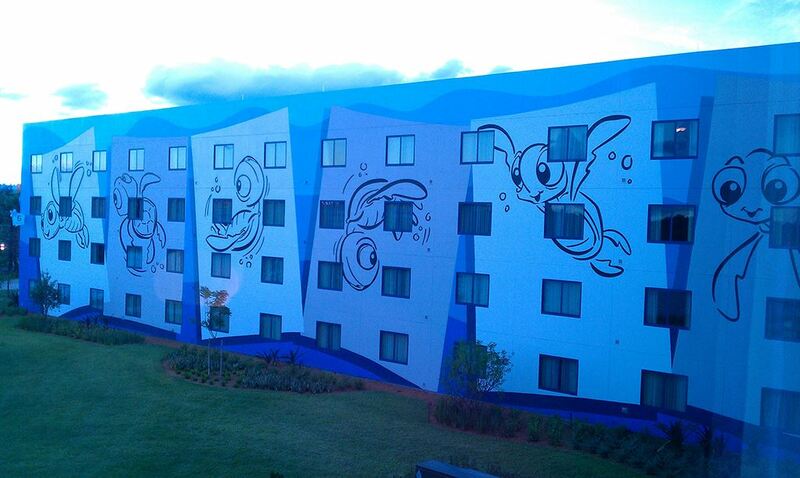 Disney’s Art of Animation resort is the newest of the Disney-owned hotels at Walt Disney World, opened in 2012. 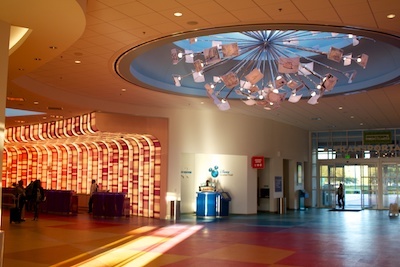 Adjacent to its sister value resort, Pop Century, the Art of Animation area was originally planned to be part of Pop Century and represent the years 1900–1949, but construction was put on hold during an economic downturn. When the time came for a new value-priced resort, Disney switched the theme to its animated movies, which still fit in well with the pop-culture motif across the lake. As at Pop Century, large, colorful icons stand in the middle of each group of buildings; here, though, they represent film characters rather than pop-culture touchstones. An interesting departure from the other Value resorts is the outside paint schemes: Rather than using pastels, Disney has decorated the exteriors with giant murals stretching the length of each structure. 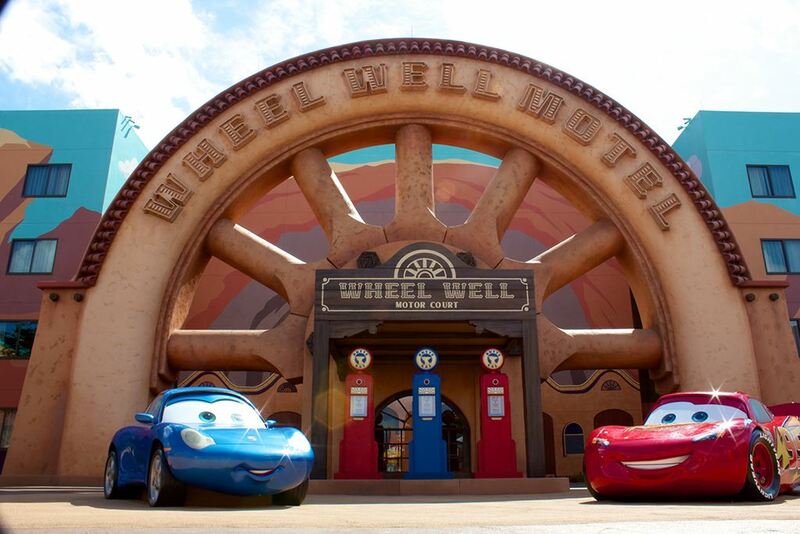 The Cars buildings, for example, each display a four-story panoramic vista of the American desert, with the movie’s iconic characters in the middle, while the Lion King buildings capture a single verdant jungle scene. It’s a great idea. Look for Building-sized Disney and Pixar characters. 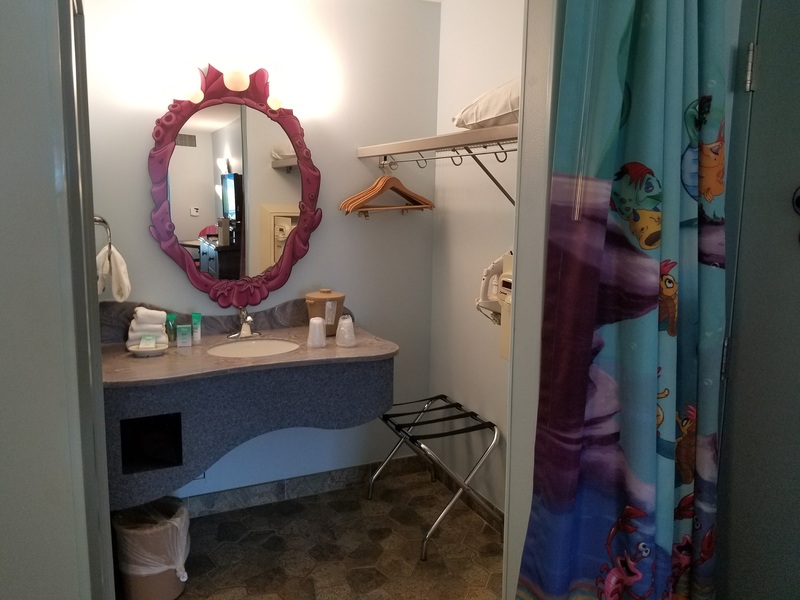 Slightly larger than comparable rooms at other value-level resorts, standard rooms are 277 square feet and include two double beds or, by request, one king-sized bed, a flat-panel TV, a mini-fridge, and a table and chairs. Up to four guests may be booked into a standard room. 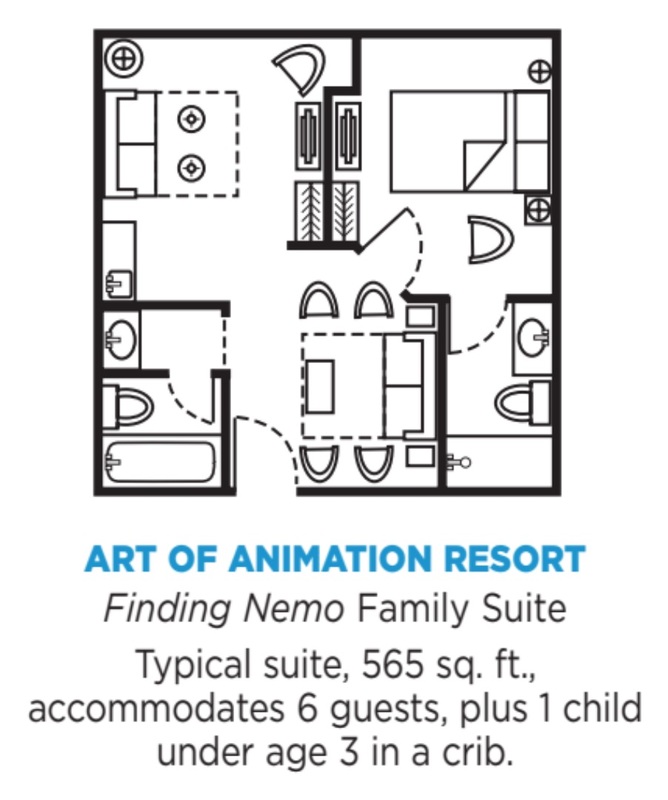 Art of Animation’s family suites are 565 square feet, about what you’d get by combining two standard rooms into one suite. 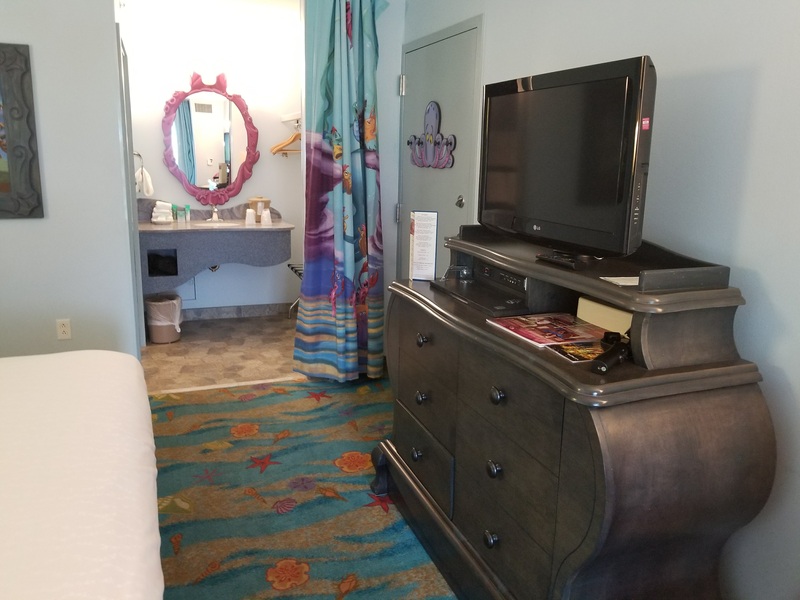 Each suite has a master bedroom, a living room, two full bathrooms, and a kitchenette with mini-fridge, microwave, and coffeemaker. Sleeping accommodations include a queen bed in the bedroom, a full-size sleeper sofa, and a living-room table that converts into a full-size bed. The bedroom and living room have flat-panel TVs. Up to six guests may be booked into a suite. 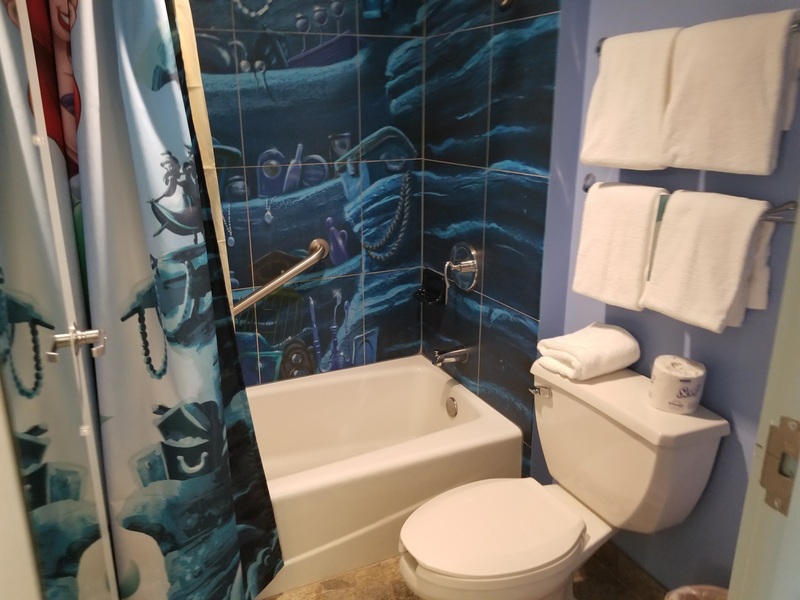 Left: Little Mermaid themed standard hotel room. 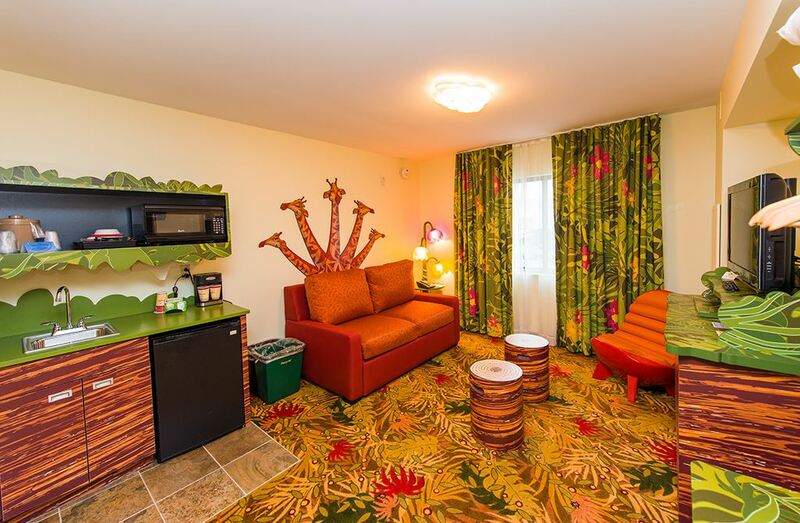 Right: Lion King themed family suite, outer room. Standard Art of Animation bathrooms are tiny but functional. Almost all feature a tiled tub with shower, while some wheelchair-accessible rooms have a roll-in shower without tub. Water pressure is adequate, but probably less than what you get at home. A separate dressing area next to the bathroom includes one sink, but not much counter space. A 1500-watt, wall-mounted hair dryer is provided. Guests with long or thick hair may find that the dryer is underpowered for their needs. 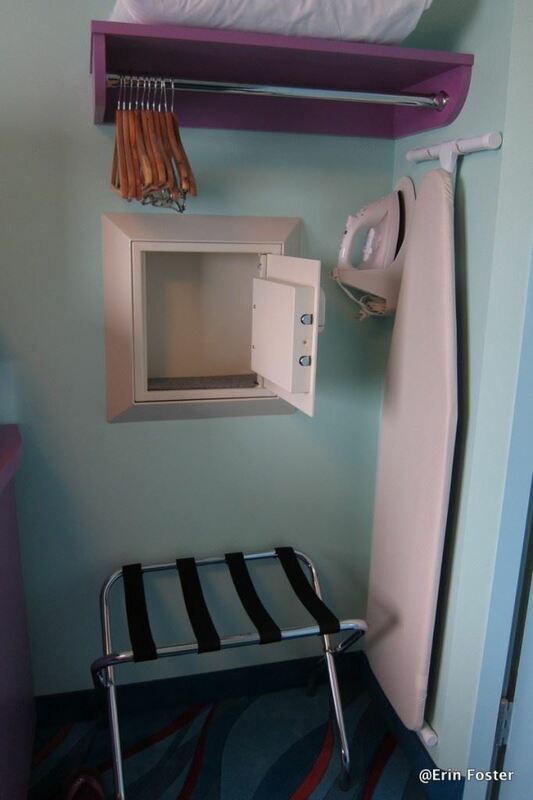 The dressing area includes a curtain that separates it from the sleeping area. Combined with the bathroom, this means that 3 people can get dressed at the same time. 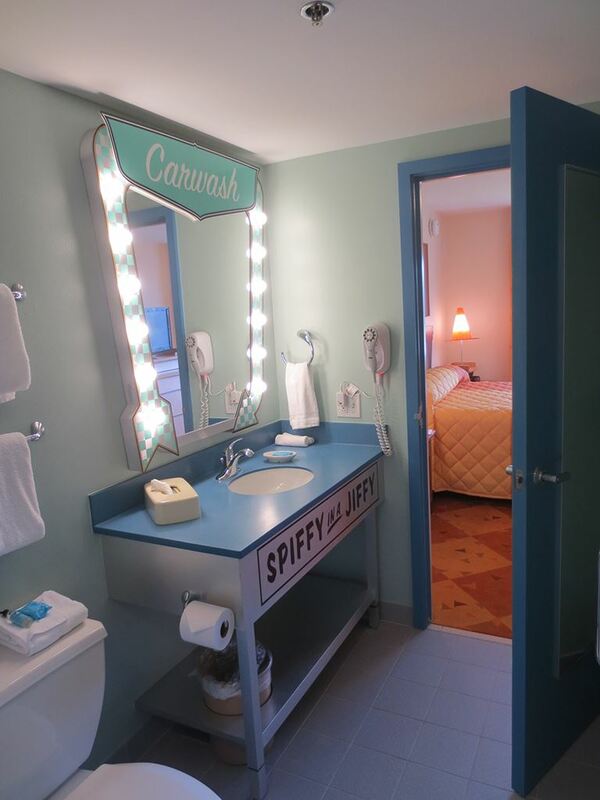 Bathroom and dressing area and sink in Art of Animation's rooms. 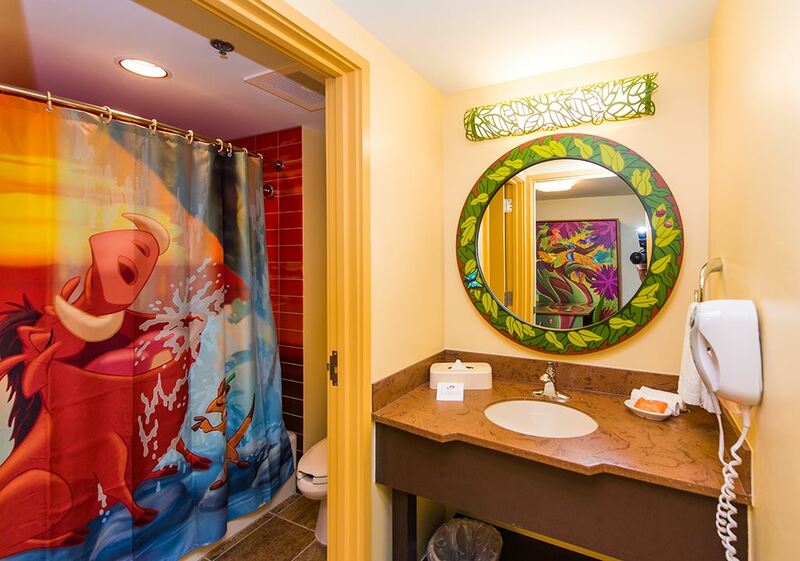 Family suites Art of Animation have two bathrooms. 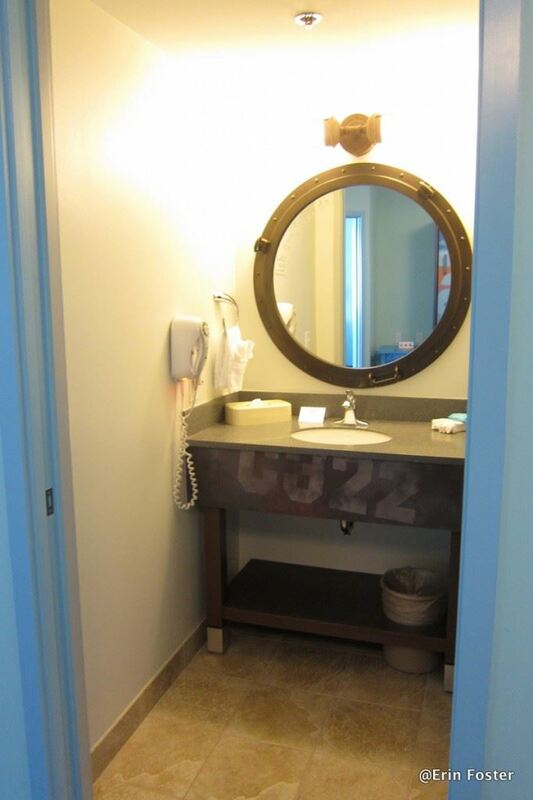 One is small and functional, nearly identical to the bathrooms in the standard rooms. 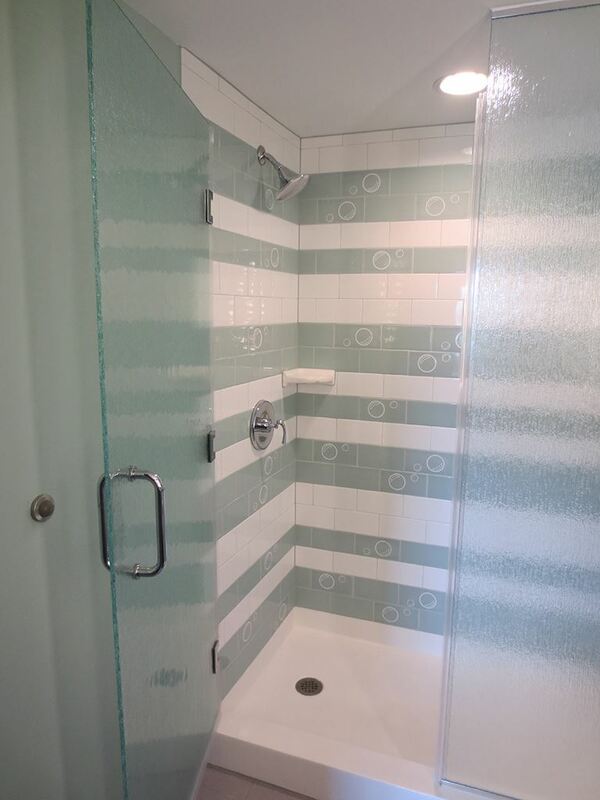 The master bathroom is spacious, with a large glass-door shower. Art of Animation has approximately 200 handicap-accessible rooms. 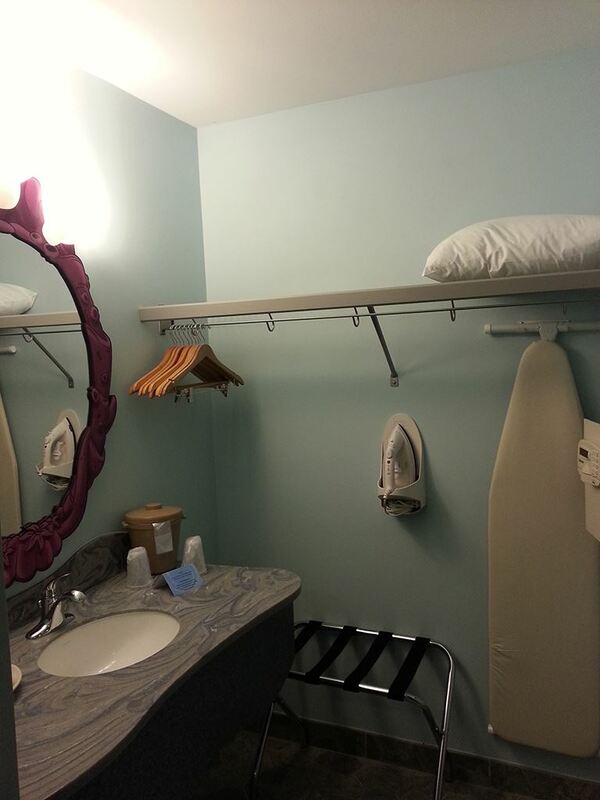 Some feature roll-in showers, while others include assistive hearing devices. Mobility access rooms comply with Florida's Accessibility Code, with changes to everything from bed, counter-top, and dresser drawer height, to door widths, wheelchair ramps, and more. 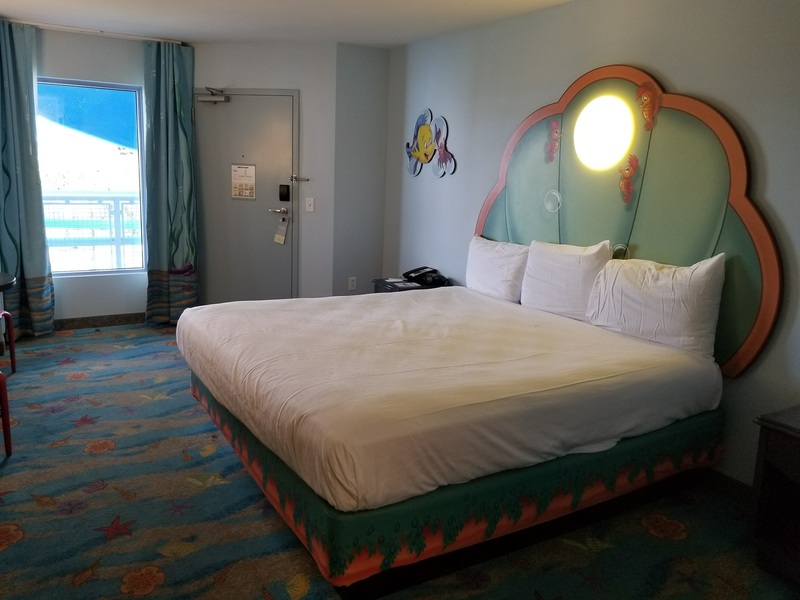 Some of Art of Animation's accessible rooms have the standard setup of 2 double beds; all rooms with roll-in showers have 1 king bed, and a small number of roll-in shower rooms have both 1 king bed and 1 double bed. Use our hotel room finder to see which rooms have which features. For a nightly fee of $50 on top of the room charge, up to 2 dogs are allowed in some Art of Animation rooms. A check-in package of dog-friendly items comes with the extra fee, but so do several special rules. Housekeeping will only enter the room while the human guests are present, special Do Not Disturb tags are mandatory, and guests may be called to come to their room if the dog is being too noisy. 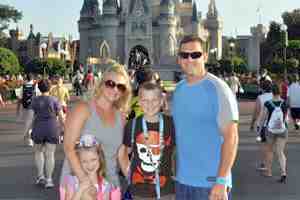 Mousesavers.com has a current list of Disney hotel discounts available at Art of Animation. 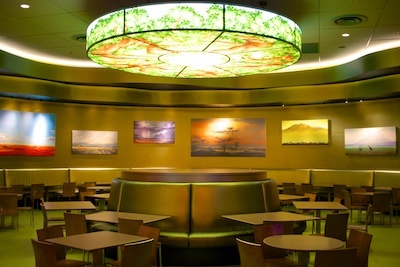 There is no full-service restaurant at any Disney value resort, including Art of Animation. The food court, Landscape of Flavors, is organized like a food court at a mall. There are 5 different stations, each selling one set of meals. For example, one station sells pizza and pasta; another sells burgers; another is dedicated to sandwiches, and so on. If your kids each want something different, you'll have to line up several times. The good news is that much of the food is prepared on demand, so you'll be getting your burger cooked to order. 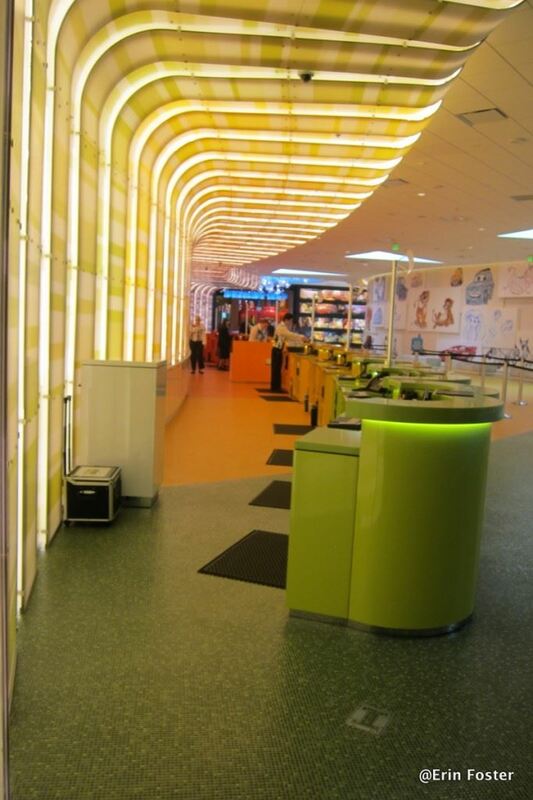 Also keep in mind that the food court at the nearby Pop Century resort is just a quick walk away. Landscape of Flavors We've found that Landscape of Flavors offers the best food out of all the value resorts. Menu highlights include Mongolian Beef and Pastrami Cheeseburger. There is a nice salad bar and a create-your-own-pasta station with fresh ingredients. Stand-out desserts include fresh-made smoothies and gelato. We've also received positive feedback about breakfast served at Landscape of Flavors. The Drop Off Poolside spot with speciality drinks and a full bar. Limited selection of snacks and cold sandwiches. Landscape of Flavors is set up like a mall food court. Five different stations each serve a different type of food. A separate beverage station serves free refills on fountain drinks, coffee, and tea. Pools Art of Animation has 3 pools. 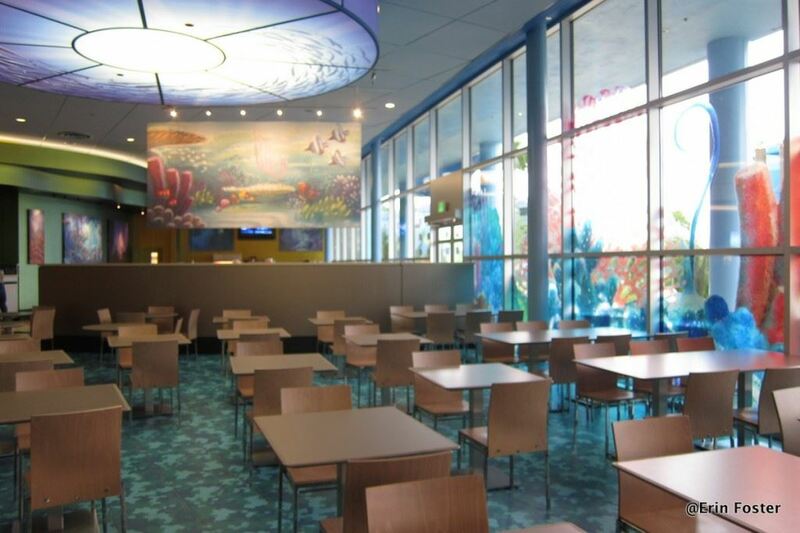 The largest, The Big Blue Pool, sits directly behind the Animation Hall lobby and food court, between the two Buildings dedicated to Finding Nemo. The pool features a sculptures of characters from the film like Crush. There is a toddler water play area adjacent to The Big Blue Pool. One fun feature of the main pool is that audio snippets from the Finding Nemo film are played so that they can only be heard under water. The two Buildings of the Cars section contain the Cozy Cone Pool. 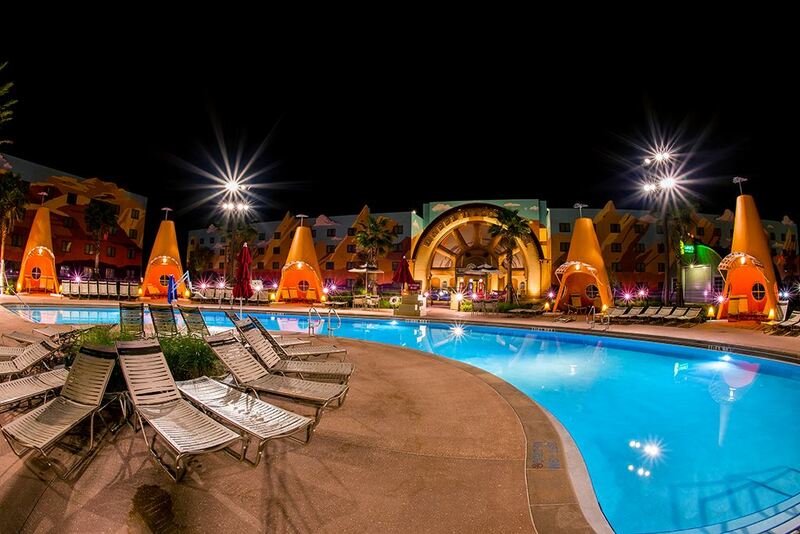 This pool area is themed after the Cozy Cone Motel from the Cars movies, and features giant traffic cones. The Cozy Cone Pool is considered a "quiet pool," meaning that loud play and splashing around are discouraged. 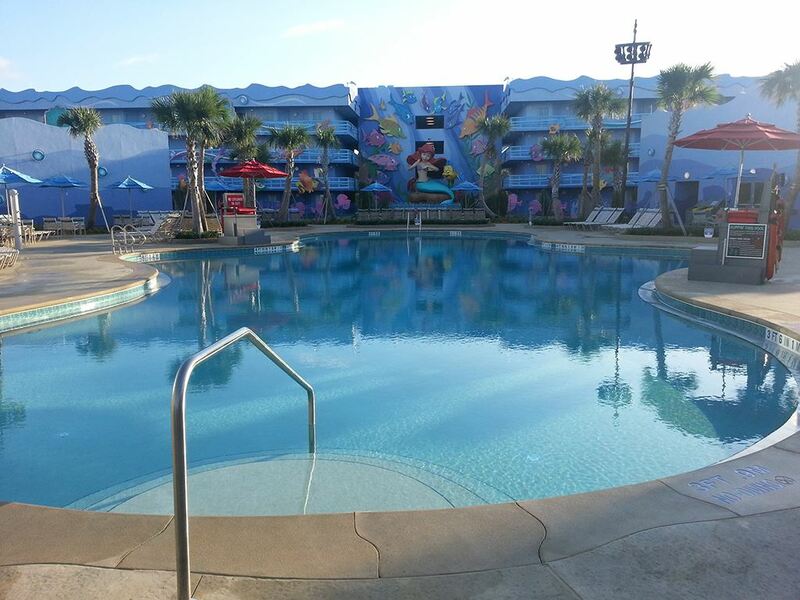 The third pool is located in the Little Mermaid section of the resort. 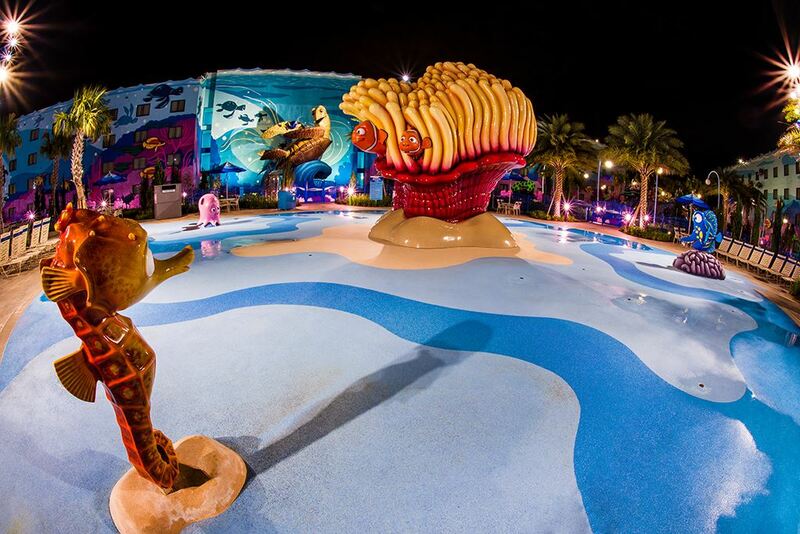 This pool is also considered a quiet pool and it is surrounded by large sculptures of King Triton and Ursula. Art of Animation's pools range in depth from around 3 feet 6 inches/1.1m to 4 feet 9 inches/1.4m. They are open every day, including winter. Pools are heated to 82F/28C throughout the year. 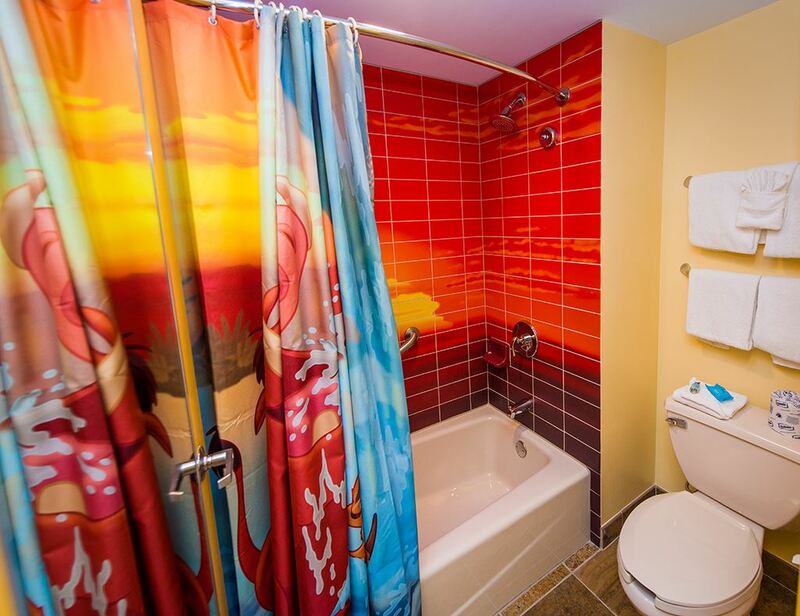 Art of Animation does not have a hot tub or jacuzzi; those are found at Disney's moderate and deluxe resorts. 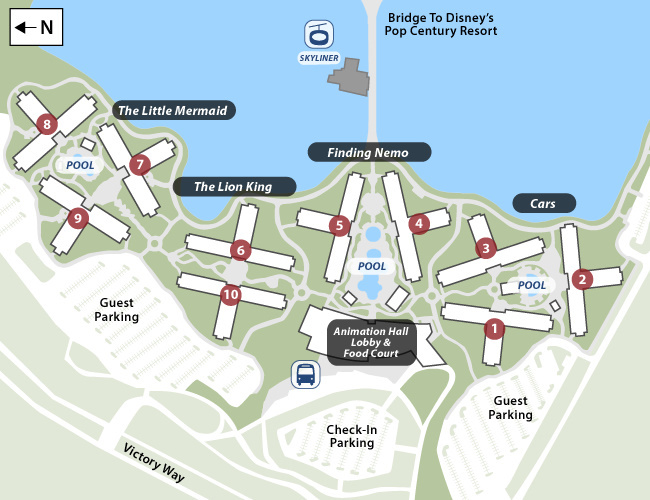 There are no water slides at Art of Animation's pools, or any of the value resort pools, but guests can find showers, storage lockers, restrooms, and laundry facilities at each of the three pools. Infants and children in diapers are welcome in all of Animation's pools, as long as they're wearing swim diapers. Water wings are allowed at all Disney pools, and every pool has free life vests in a variety of sizes. Art of Animation's Big Blue Pool has a chair-lift device that can lower guests in wheelchairs into the shallow end of the pool. Check with any lifeguard for assistance on using the lift. Arcade Located just off the Animation Hall lobby is the Pixel Play Arcade, which has a decent collection of relatively recent video and arcade games. Most games cost $0.50 to $2.00 per play. Business Center The lobby includes a small business area with computers, printers, and copiers for guest use. Jogging Walkers, joggers and runners will find that one lap around Hourglass Lake, which separates Disney's Pop Century Resort from the Art of Animation Resort, is a scenic 1.28-mile/2 km course. Generation Gap Bridge cuts through the middle of the course. If you're looking for a different distance, one lap around half the lake, including Generation Gap Bridge, is about 0.7 miles/1.2 km. You won't find a gym, fitness center, indoor pool, or spa at Art of Animation. The Cozy Cone Pool and Flippin' Fins Pool are a quiet pool, free from loud play and splashing around. Check In/Out Time: Check-in time at Art of Animation is 3:00 PM, and check-out time is 11:00 AM. Online Check-In: Art of Animation participates in Disney's Online Check-In program, which allows you to you provide name, address, and credit card information up to 60 days before your arrival. If you've checked-in online and provided a mobile phone number or email address, you will receive your room number electronically. Guests living in the United States and a few other geographic areas will have Magic Bands mailed to their home prior to their arrival. If you've completed online check in and have your MagicBand, you may go straight to the room bypassing the lobby altogether. Magic Bands: Magic Bands are rubber/plastic wrist bands which function as your room key and resort identification. Depending on what options you've selected, your MagicBand may also function as your park ticket, dining plan ticket, or charge card. Magic Bands are included with your resort stay. Lost and Found : If you lose something during your stay, contact Disney's Lost and Found department by calling (407) 824-4245. Shopping: Art of Animation gift shop is Ink and Paint Gift Shop, and sits just off the lobby, between the check-in area and the food court. As you'd expect from Disney, Ink and Paint has a decent collection of souvenirs ranging from small trinkets such as keychains and pens, to embroidered jackets and Disney princess dresses. Ink and Paint Gift Shop also sells basic pharmacy items such as sunscreen, aspirin, allergy and cold medicine, baby diapers and formula, shampoo, and the like. And Ink and Paint has Disney-branded cookies, chocolate, coffee tins, and similar items. 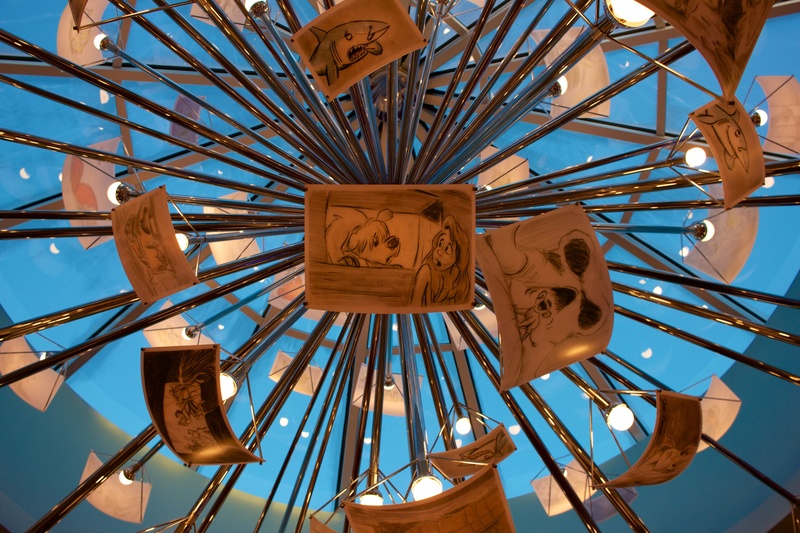 The hotel's lobby, called Animation Hall, brightly colored and features art from Disney and Pixar films. 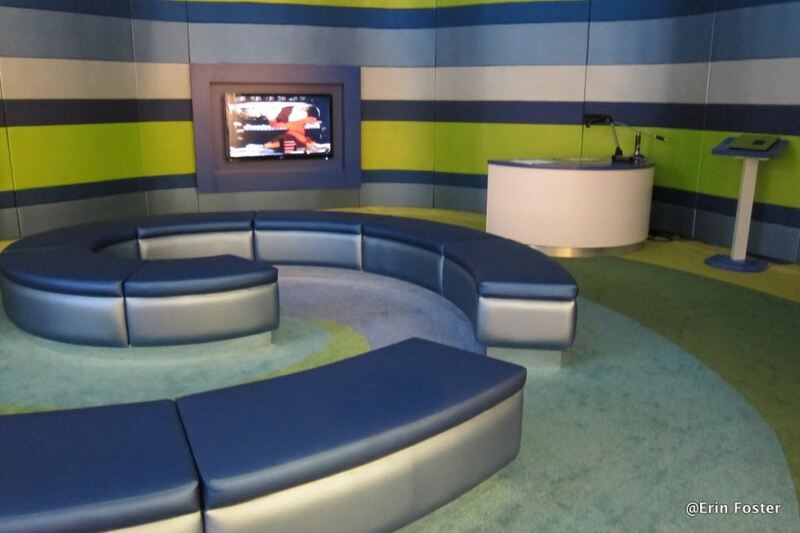 Kids can watch class Disney animation in a special waiting area while parents check in. Disney's Pop Century Resort is just off of I-4 in Lake Buena Vista. Take I-4 Exit 65 - Animal Kingdom / Wide World of Sports and you'll end up on Osceola Parkway. Stay on Osceola for 0.9 miles/1.5 km, then turn right on Victory Way. Go about 0.6 miles/1 km down Victory Way, then turn right on to Century Drive, which is Art of Animation's entrance road. You'll see Art of Animation's sign well before you need to turn. A security gate guards the entrance to Art of Animation's grounds. If you arrive by car, you'll need to provide photo ID at the gate; it's not necessary to provide your reservation number or paperwork. A dedicated parking lot across from the lobby serves as temporary parking for those who need it while checking in. Guests keeping a car at Art of Animation overnight will be charged $13 per day. Sanford International Airport is about a 40-minute drive from Sanford to Art of Animation. If you're not renting a car, be aware that Sanford's airport offers fewer transportation options than Orlando's, and Sanford's options are generally much more expensive. A taxi from Sanford International Airport to Art of Animation will cost between $120 and $150, depending on traffic. Mears Transportation offers 3-passenger towncar service to Art of Animation for around $140 each way, plus tip; 5-passenger SUV service or 10-passenger van is around $190 each way. That means round-trip transportation will run you somewhere between $240 and $380, plus tip, between Sanford and Art of Animation. You may also want to consult ride-sharing services such as Uber or Lyft for their pricing options. Disney provides free bus service from Art of Animation to the Magic Kingdom, Epcot, Disney's Hollywood Studios, Animal Kingdom, Blizzard Beach, Typhoon Lagoon, and Disney Springs. Art of Animation's bus stops sit along the front wall of the Animation Hall lobby, between the lobby and check-in parking lot. Each theme park has its own bus stop somewhere along the wall. Animal Kingdom's bus service is shared with Blizzard Beach, while Disney Springs and Typhoon Lagoon also share a stop and service. If you have your own car, it's faster to drive yourself to Disney's Animal Kingdom, the Typhoon Lagoon and Blizzard Beach water parks, and Disney Springs. Disney's bus service is faster to the Magic Kingdom, Epcot, and Disney's Hollywood Studios. Ask a Disney Castmember about Art of Animation's bus schedule, and they'll tell you that buses run about every 20 minutes. In reality, Art of Animation's bus schedule varies considerably depending on the time of day and where you're headed. For example, if you're headed to the Magic Kingdom between 8 AM and 11 AM, you'll wait around 8 minutes, on average, for a bus to arrive. The bus schedules for Epcot, Animal Kingdom, and Disney's Hollywood Studios are about the same early in the day, with a bus arriving every 12-23 minutes, on average. Bus schedules to the water parks and Disney Springs are a little less frequent, and you could wait anywhere from 15 to 37 minutes for a ride. Buses run a little slower from around 11 AM to around 4 PM, when most people are already in a park. Disney's evening buses are scheduled around the theme parks' closing times, where most of the fleet is deployed to get guests back to their hotels. 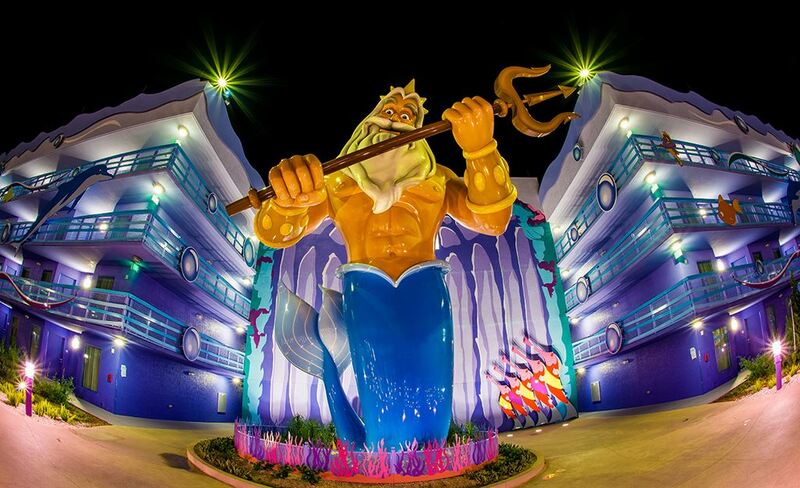 Your waits to return to your hotel from a theme park should average out to around 21 minutes under most circumstances. 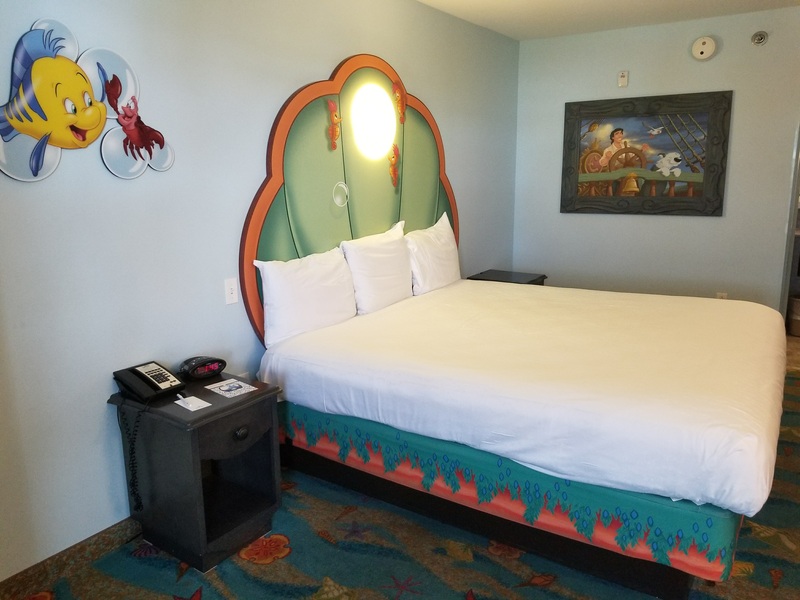 If you have dining plans at another Disney hotel, the cheapest option is to take a Disney bus from Art of Animation to Disney Springs, then take another bus from Disney Springs to your destination hotel. Do the reverse to get back to Art of Animation. While that's free, it can take anywhere from 90 minutes to 2 hours each way. If your destination is one of the Magic Kingdom monorail resorts, and the Magic Kingdom is still open, you could take a bus to the Magic Kingdom, then either walk (to the Contemporary and Bay Lake Tower), hop on the monorail (to the Polynesian and Grand Floridian), or take a boat (to Fort Wilderness, the Wilderness Lodge, and the Grand Floridian). We suggest you still allow at least an hour for that. However, the fastest option is almost always a taxi or ride sharing service such as Uber or Lyft from Art of Animation. 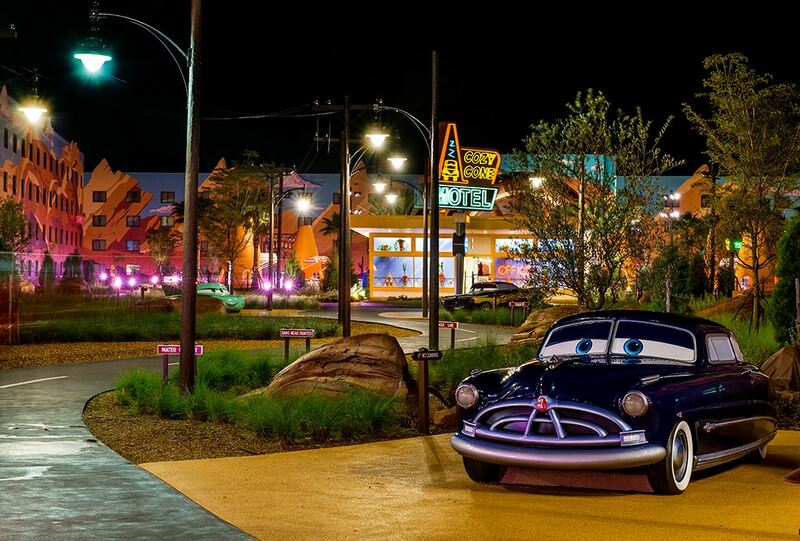 The Cars area features life-size versions of Cars film characters. 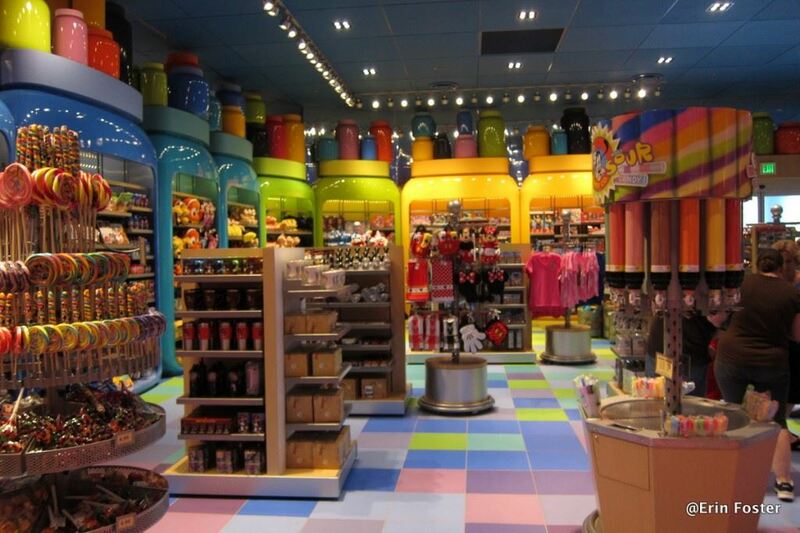 The Ink and Paint Shop sells a variety of Disney-themed merchandise. Art of Animation I was skeptical about. From pics it looked like it was going to be a child’s dream but not necessarily an adult’s. I was wrong—it’s incredible! For a Value resort, it feels more like a Deluxe. The room was awesome; great layout and having two bathrooms was so nice. The Big Blue Pool and the Cozy Cone Pool are great. Landscape of Flavors impressed me too—so many options for fresh, delicious, comfort food as well as exotic fare. There was no AT&T service inside the building where our rooms were. There was plenty of service outside the building, but the moment we stepped inside it was like a vacuum. It was very upsetting. The room was very poorly soundproofed. I heard snoring and bathroom noises from other rooms that I should not have been able to hear. One afternoon my toddler and I returned to the room for a nap—I suppose housekeeping was cleaning the room above ours, but it sounded like someone was bowling up there. 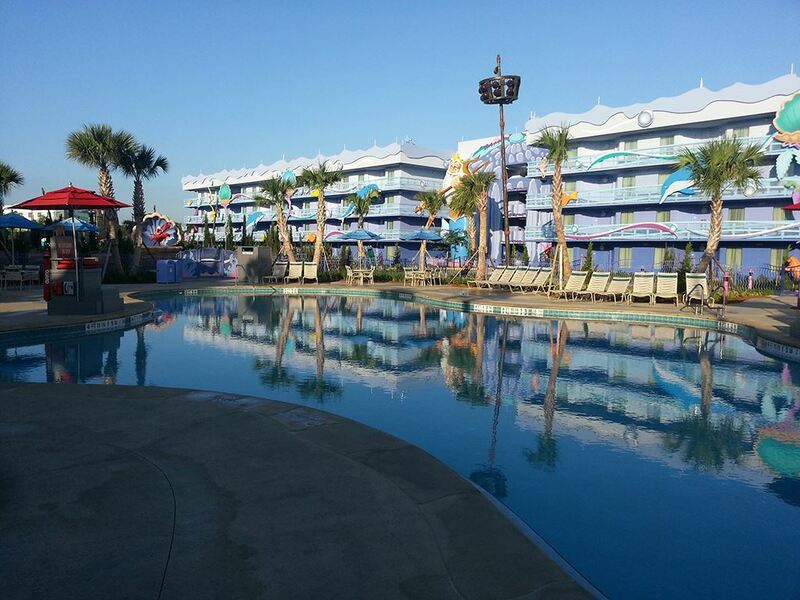 #AskIt Results: Does Disney Need More Value Resorts? Art of Animation has better views than the other Value resorts but you still won't find anything near the level of a Deluxe resort. But there are a few rooms that are better than a parking lot. Building 1 rooms facing south have great views of the Cars-themed courtyard. This major advantage of this Building is the short walk to Animation Hall. Good views in Building 1 include rooms 1X01, 1X03, 1X05, 1X07, 1X09, 1X11, 1X13, 1X27, 1X29, 1X31, 1X33, 1X35, 1X37, and 1X39 (replace X with the floor number). Rooms 1X02, 1X04, 1X06, 1X08, 1X10, 1X12, 1X14, 1X15 to 1X26, 1X28, 1X30, 1X32, 1X34, 1X36, 1X38 and 1X40, which face a parking lot and service areas. building. Room 1521: A giant lawn and a parking lot. Rooms 2X13, which face a parking lot. Rooms 2X15 and 2X17, which face a power box. Rooms 2X02, 2X04, 2X16, 2X18, 2X20 which show a service area. Room 2521: If you squint you can see Hourglass Lake. Room 2527: A view of The Cozy Cone Pool. Building 3 rooms facing Southwest look out on to the Cars courtyard. Some rooms facing Northwest have a good view of Hourglass Lake. Good views in Building 3 include rooms 3X01, 3X03, 3X05-3X13, 3X22, 3X24, 3X26, 3X27, 3X29, 3X31, 3X33, 3X35, 3X37 and 3X39. Rooms 3X15, 3X28, 3X30, 3X32 and 3X34, which show a service area. Room 3529: Another view of the Cars courtyard. Building 4 has the advantage of being close to Animation Hall. Northern facing rooms having good views of The Big Blue Pool. Good views in Building 4 include rooms 4X01, 4X03, 4X05, 4X07, 4X09, 4X11, 4X13, 4X27, 4X29, 4X31-4X34, 4X36, 4X38, 4X40. Rooms 4X04, 4X02, 4X16, 4X18, 4X20 and 4X22, which show a service area. Rooms 4X17, 4X28 and 4X30, which face an electrical box. Room 4504: You probably wont want to wake up to a view of a service area. Room 4511: A view of The Big Blue Pool. 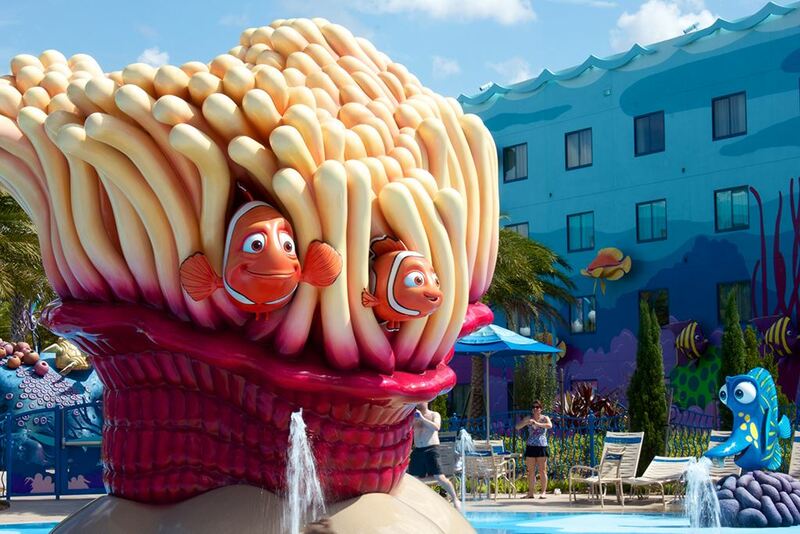 Like Building 4, Building 5 is also themed after Finding Nemo. 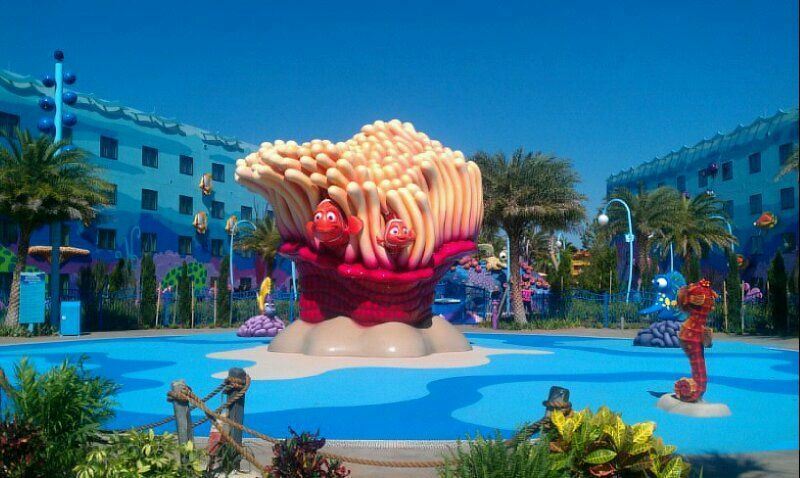 It is closely located near Animation Hall and The Big Blue Pool. Good views in Building 5 include rooms 5X01, 5X03-5X09, 5X12, 5X14, 5X20, 5X22, 5X24, 5X27, 5X29, 5X31, 5X33, 5X35, 5X37 and 5X39. Rooms 5X15, 5X17, 5X19, 5X28, 5X30, 5X32 and 5X34, which show a service area. Rooms 5X02 and 5X18, which shows an electrical box. Room 5507: Looking out at the Schoolyard Sprayground. Room 5523: This isn't the best view but the noise level will be low. Good views in Building 6 (rooms 6X09, 6X11, 6X13 and 6X37) offer views of the courtyard with sculptures of characters from The Lion King. Other good views look out on to Hourglass Lake include rooms 6X06, 6X19, 6X21, 6X23, 6X25, 6X32, 6X34, 6X36, 6X38 and 6X40. Rooms 6X02, 6X04, 6X16, 6X18 and 6X20, which show a service area. Rooms 6X15, 6X17, 6X28 and 6X30, which faces an electrical box. Room 6511: Sleep well knowing Simba is watching over your room. Room 6518: Yet another service area used by the hotel staff. 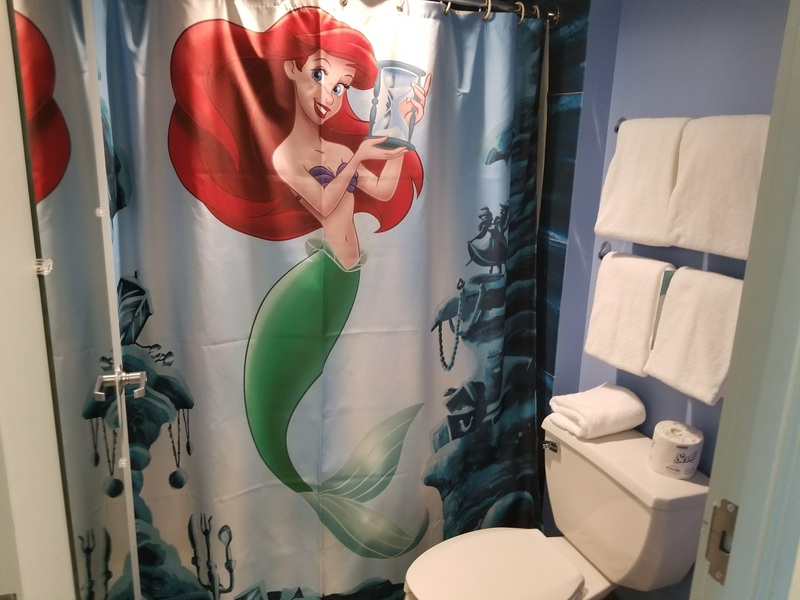 Building 7 (like its neighbor Building 6) is also themed to The Little Mermaid. 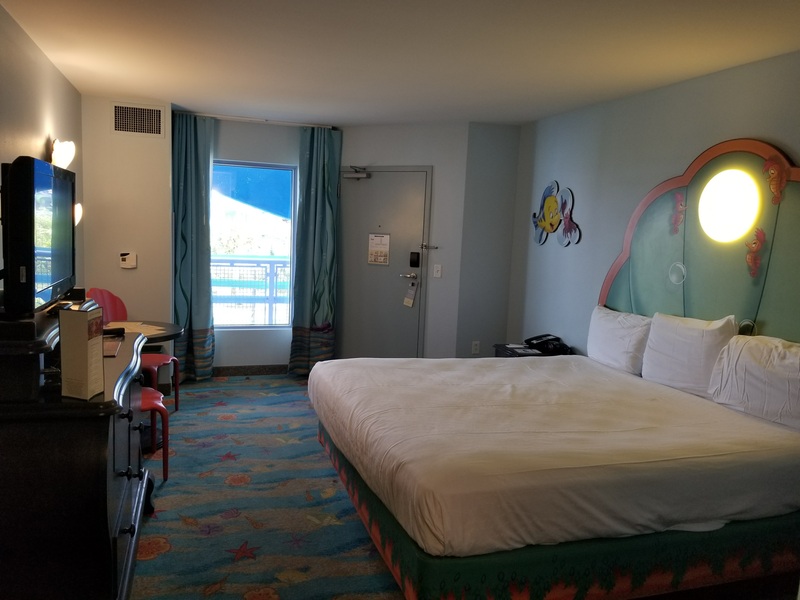 Rooms facing Northwest have a view of The Flippin' Fins Pool. Good views in Building 7 include rooms 7X01-7X12, 7X61-7X72, 7X13-7X19, 7X37-7X44 and 7X53-7X60. Rooms 7X19-7X30, which show a service area. Rooms 7X45-7X47, which face an electrical box. Rooms 7X61-7X66, which face a maintenance building. Room 7662: A bad view of a large maintenance building. Room 7870: Looking down at The Flippin' Fins Pool. The major disadvantage of Building 8 is that it is the farthest from Animation Hall. It also the building with the least amount of good views because the vast majority face a parking lot. Good views in Building 8 include rooms 8X61-8X72. Rooms 8X01-8X09, which face a maintenance building. Rooms 8X13-8X60, which face a parking lot. Room 8502: After a week with this view you'll think the fish were talking to you in your sleep. Room 8556: The other side of Building 8 mostly faces a parking lot. 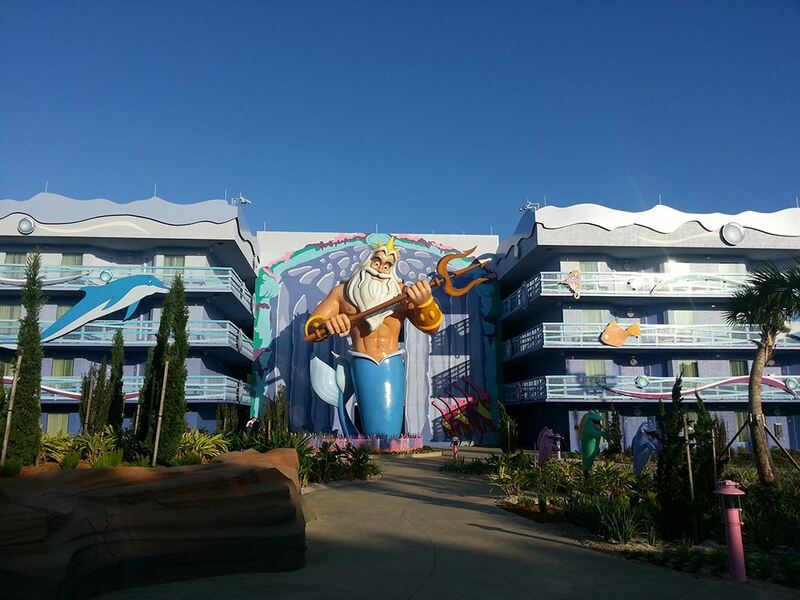 Building 9 is the third building themed after The Little Mermaid. Like Building 8, this building also suffers from most of its rooms facing a parking lot. Good views in Building 9 include rooms 9X01-9X09 and 9X61-9X72. Rooms 9X10-9X12, which face a maintenance building. Rooms 9X13-9X60, which face a parking lot. 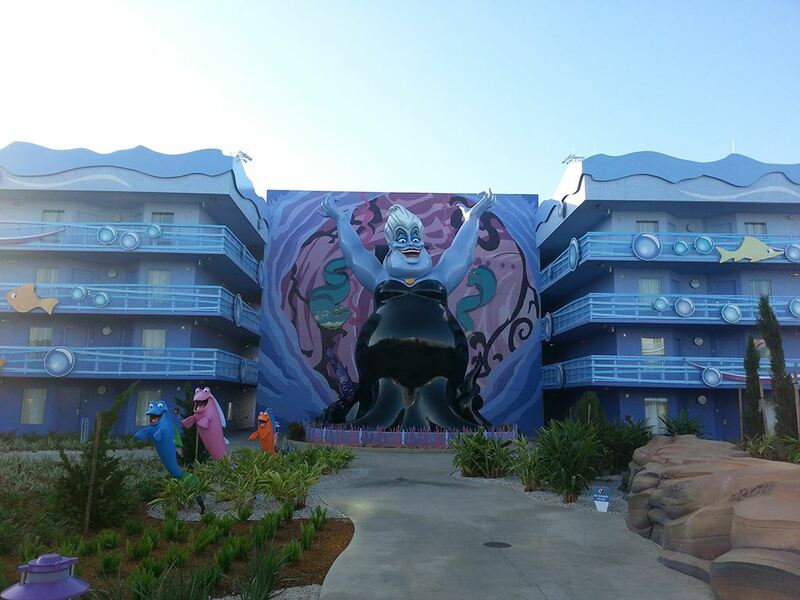 Room 9501: It's not scary at all having Ursula tower over your room. Room 9554: More parking lots. Good views in Building 10 are hard to come by, mostly because next to a large parking lot. 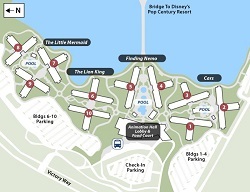 It is also the only building in Art of Animation to not be located next to a body of water. Good views in Building 10 include rooms 0X07, 0X09, 0X11, 0X27, 0X33, 0X35 and 0X37. Rooms 0X02, 0X04, 0X06, 0X08, 0X10, 0X12, 0X14, 0X16, 0X18, 0X20, 0X22, 0X24, 0X26, 0X28, 0X30, 0X32, 0X34, 0X36, 0X38 and 0X40 which face a parking lot. Room 0504: A magical view of dirty towels and a parking lot. Room 0511: Who doesn't want Scar sitting outside their window? Rated 4.0 out of 5.0 based on 893 reader ratings.